Farissa is a teenage girl trying to live a normal life with a threat constantly hanging over her head. The King rules the land assisted by small metal protectors known as Cogsman and this was how it had been for many years, until The Amar appeared. The Amar are an alien species that woo The King and eventually become closer to him than the Cogsman. They insist on one thing, young consecrated woman they can take into the mysterious Silver Sickle. Farissa is one of these women and unlike some of the other young girls who believe that the Silver Sickle is a heaven that waits for them, she knows there’s no coming back when she’s eventually taken. One of the many reasons the King finds the Amar so intriguing is the rumour that they are immortal. The Amar encourage everyone to believe this but Farissa knows this is a lie, moments before they killed her mother she watched her destroy an Amar. Armed with this fact her boyfriend Zel creates a machine that can kill them and they hatch a plan to escape the city and evade her fate. But the Amar have eyes and ears everywhere and soon they discover Zel’s invention and before the young couple know what’s happening Zel is running for his life and Farissa is abducted by the Amar. Can they save each other or is the evil behind the Amar set to destroy the human race? This YA fantasy was a welcome breathe of fresh air after a run of rather serious literary novels. 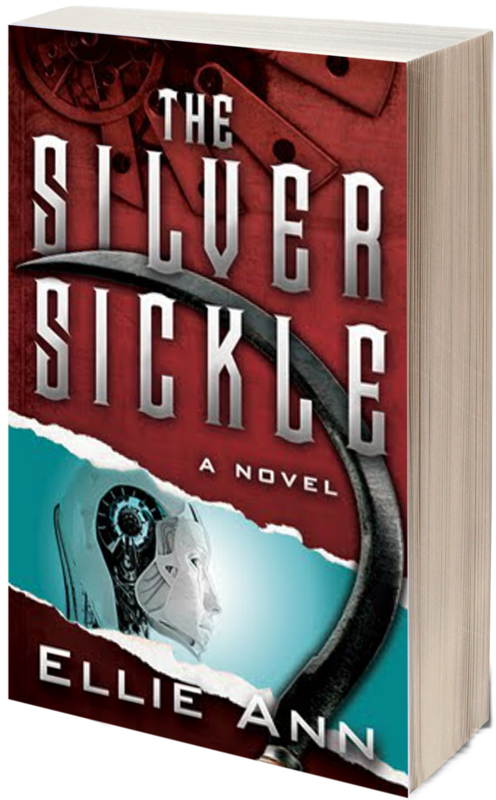 The characters that really stood out to me throughout The Silver Sickle were the Cogsman. These metallic good guys added a steampunk feel to this fantasy that fitted beautifully. They also reminded me of the fabulous Tick Tock character from the Return to Oz movie (one of my favourites) which meant I couldn’t help but view them fondly. Farissa and her boyfriend Zel have a lighthearted yet emotional romance, meaning this novel is suitable for all level of teenagers and never crosses over into adult territory. Although the relationship between the Amar, King and Cogsman took me a couple of re-reads to get to grips with I found the storyline both unique and hugely enjoyable. Ellie Ann paces the tension of the book superbly and by the end, you’re willing Farissa and Zel on with all your might. Imaginative, gripping and enjoyable YA.